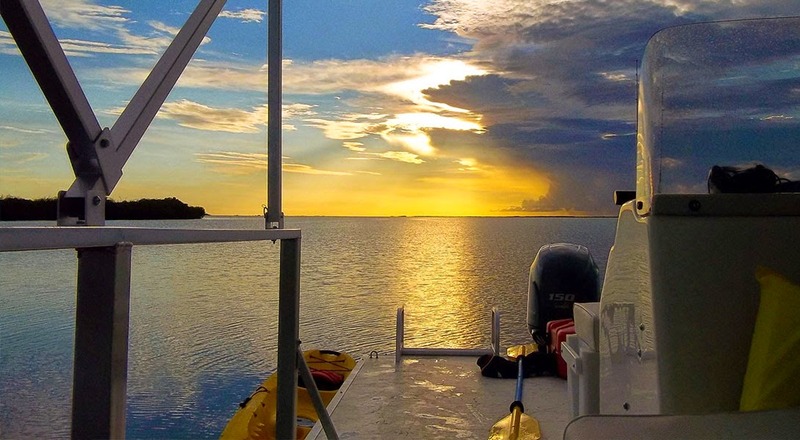 Would you like a more remote, unspoiled Key Largo kayaking experience? Come Kayak key largo with us! You can be kayaking in Key Largo more remote and interesting areas. We take you on our spacious, smooth-riding pontoon boat to areas of the back-country where you’ll likely not see another boat all day. We take you to paddle in remote areas of Florida Bay and Everglades National Park. No crowds. No boat traffic. Beautiful scenery. Are you ready for a truly unique Key Largo kayaking eco-tour adventure? Explore the back-country of Florida Bay and Everglades National Park. See fish, birds, dolphins, crocodiles. You can even fish from your Key Largo kayak if you choose. Ideal for paddlers of any skill level, even beginners. No crowds. No boat traffic. Snorkel trips to the reefs of John Pennekamp Coral Reef State Park are also offered, you can even kayak the reef if you choose! We are the only boat-based kayak/paddle-board Eco-tour opportunity. 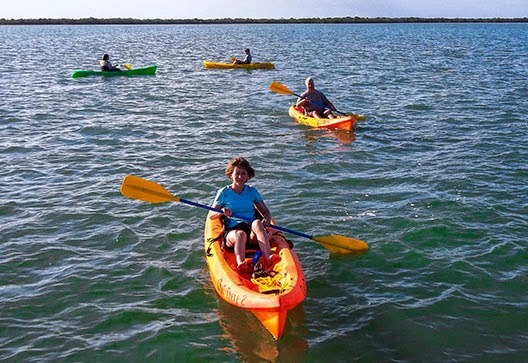 Key Largo Kayaking and Kayak Tours. We offer a number of different kayaking adventures. 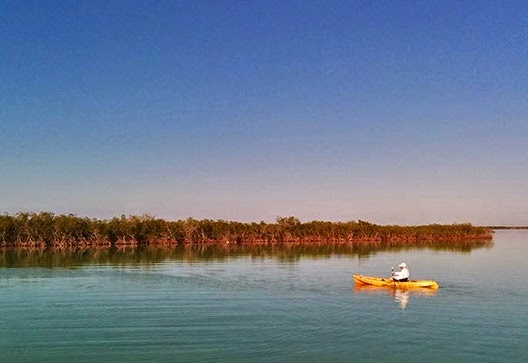 Kayak, paddle-board, fishing in Key Largo... or just look around at all the beautiful scenery. 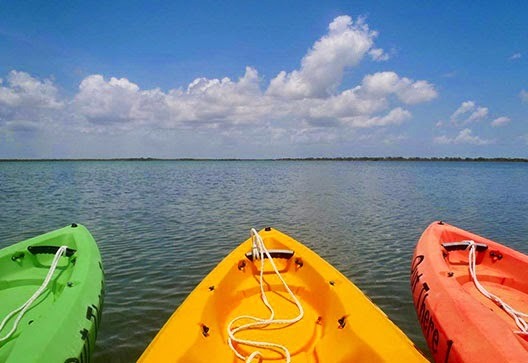 There is a Key Largo Kayaking tour right for you. 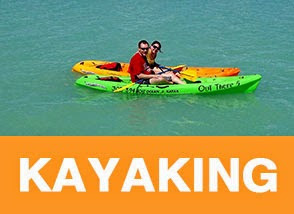 Visit the Kayaking in Key Largo Tours informational page. Want a personal Key Largo fishing experience? 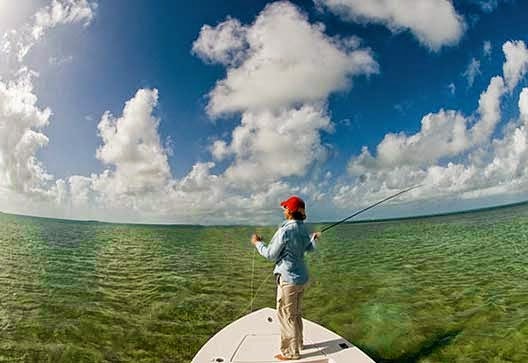 You can get out on the water and try your luck sight-fishing Key Largo for redfish, snook, trout, tarpon, bonefish, permit, and many other species that inhabit the shallow waters of Key Largo and Everglades National Park. We offer the challenge of kayak fishing. Traditional flats fishing from the bow of our skiff. Enjoy fishing in Key Largo with live bait. Key Largo fishing expeditions from 4 to 8 hours. 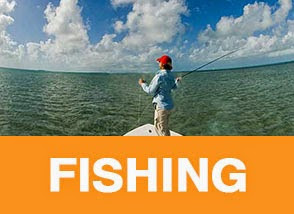 Fishing in Key Largo with us is a personal fishing experience guaranteed. Visit the Key Largo Fishing page for more information in your next Key Largo Fishing trip. "Out There" is a 26-foot custom designed and built pontoon boat powered by a 150-horsepower Yamaha 4 stroke outboard, capable of cruising the shallow waters of Everglades National Park and the back-country of Florida Bay, as well as traveling offshore to the coral reefs. 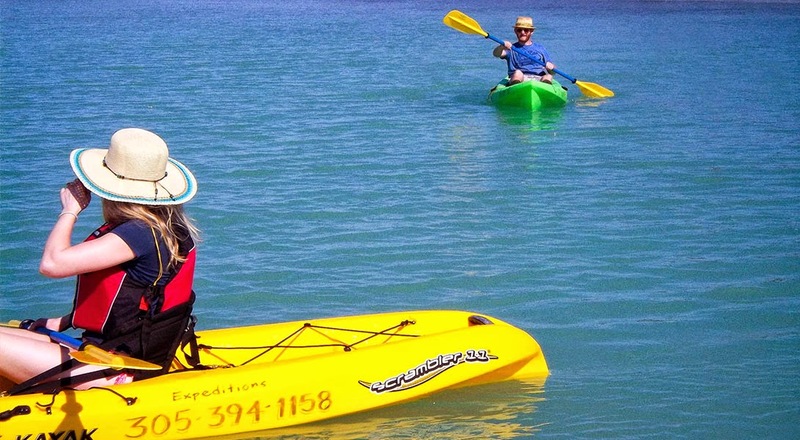 We carry a maximum of 6 passengers, so you'll never have to deal with a big crowd on your Key Largo kayak expedition. The boat is equipped with a bi-mini top to provide shade on warmer days, and features comfortable seating and ample deck space for those who prefer sunbathing over paddling. Its open layout allows for unobstructed all-around views of sunsets and scenery. The ride is stable and dry, and ideal for those who may have trepidation about seasickness.